Radial special trailer tire with automotive-grade tread has a ply rating of 10 and a 2,830-lb max load at 80 psi. Great for highway use. Fits 15" wheels. Lowest Prices for the best tires and wheels from Taskmaster. 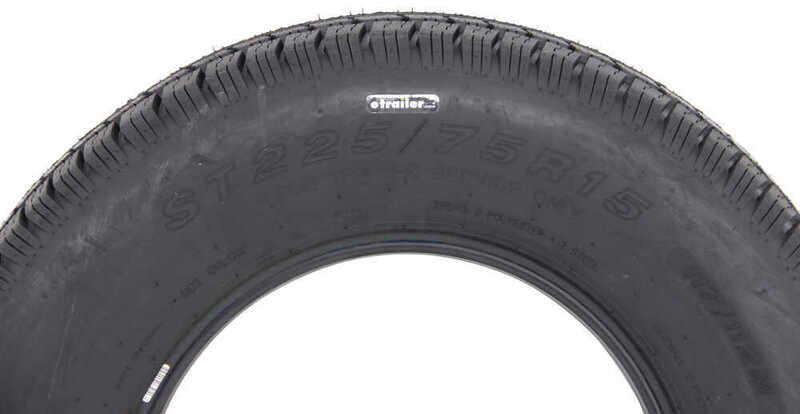 Provider ST225/75R15 Radial Trailer Tire - Load Range E part number TR225LRE can be ordered online at etrailer.com or call 800-298-8924 for expert service. Radial special trailer tire with automotive-grade tread has a ply rating of 10 and a 2,830-lb max load at 80 psi. Great for highway use. Fits 15" wheels. Outer diameter (when inflated): 28.31"
Radial special trailer tire has a ply rating of 8 and a 2,150-lb maximum load at 65 psi. Great for highway use. Fits 15" wheels. Radial tire has 10-ply rating and 2,830-lb max load at 80 psi. 15" x 6" Steel wheel has 6 on 5-1/2 bolt pattern. 3-Step powder coat finish resists rust. Improved torque retention secures wheel. Complimentary roadside assistance included. Radial special trailer tire has a 14-ply rating and a 4,080-lb max load at 110 psi. Constructed of double steel belts and plies with a nylon overlay. Fits 16" wheels and for highway use. Complimentary roadside assistance included. 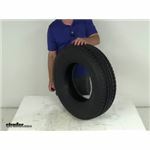 Today we're going to take a look at the Taskmaster Provider ST22575 R15 radial trailer tire in a load range E. Now this radial tire is constructed with double steel belts, double polyester cords. It's great for highway use. You do use a nylon tread firming belt overlay to help prevent any tread separation. They do offer the tread wear indicators or tread def 00:00:21 bars. What those are, you'll see those on your passenger car tires. If you look on the shoulder of our inaudible 00:00:27, we have TWI for tread wear indicator and right where it is on the shoulder if you go up to the tread grooves, right across there, if you look in the groove, you'll see a little speed bump. What that is, is that tread wear indicator is at 230 seconds tread depth 00:00:40. What that does, is when this tire wears down and that tread wear indicator is a bar straight across, that means it's at 230 seconds so the tire is actually officially worn out. As you're wearing this tire, if you look right where the tread wear indicator is, it will give you a good visual indication of how the tire is wearing. The tire is bake tested to ensure that the rubber holds up over time. Does have a nice automotive grain tread that uses the siping. The siping is the cuts that are in the tread blocks. 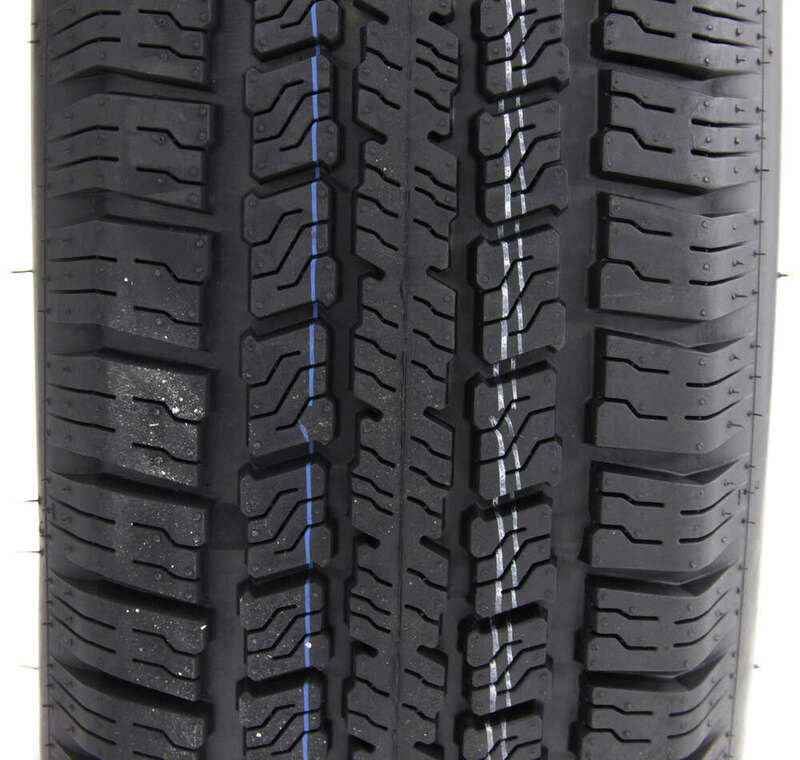 This will help channel the water away from the tire to improve traction during wet, snowy, or icy conditions. Now this tire is a special trailer tire design. It will couple 00:01:16 the strength of a bias tire with the durability and stability of a radial tire. Again this tire is created specifically for trailers. It's not intended for use on any other vehicle. It does meet the DOT, Department of Transportation's specification and it does exceed your Federal motor vehicle safety standards. A few specs on this, this tire is designed to fit on a wheel size of 15 by 6, 15 by 6-1/2 and 15 by 7. The tire size again which is stamped on the side wall, ST for special trailer, 22575 R15. The R designates that it's a radial tire. Section width on this tire is 8.8 inches. Overall diameter from the bottom to the top when it's inflated is 28.3.
this is a load range E, which means it's a 10 ply rated tire. That means this tire has a maximum load capacity when it uses a single tire, 2830 at 80 psi and if it's using a dual tire application it's 2470 pounds at 80 psi. One last thing on the trailer tires now. Almost all your new trailer tires are coming through with a speed rating stamped on them so you know what the speed rating is. That is located right after the size. You'll see two numbers, 117, 112 which is the load index and then there's a letter M. The M is what designates the speed rating, so speed rating M means 81 miles per hour speed rating. 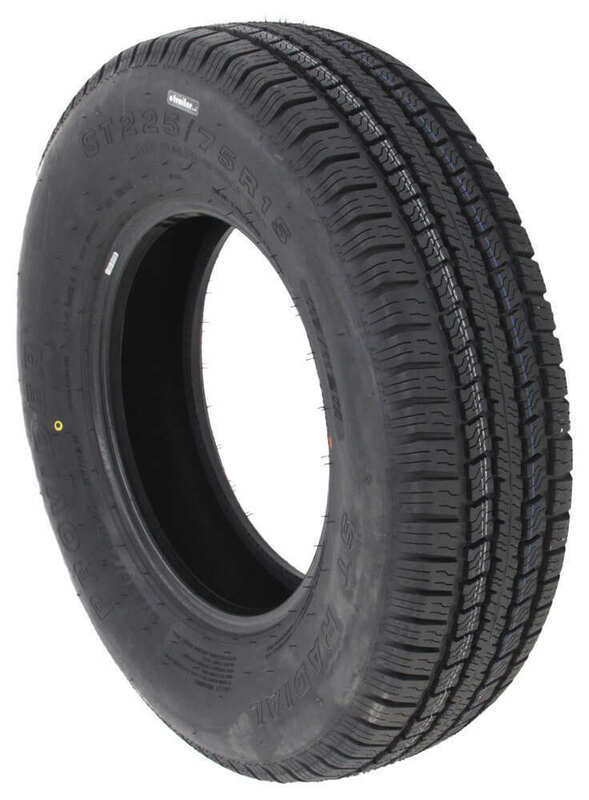 That should do it for the review on the Taskmaster Provider ST22575 R15 radial tire in a load range E.
Order: RelevanceNewestRating - High to LowRating - Low to High Radial special trailer tire with automotive-grade tread has a ply rating of 10 and a 2,830-lb max load at 80 psi. Great for highway use. Fits 15" wheels. Tires have worn pretty even they are about 12 life now. I’m pretty hard on tires with the amount of full circle turns I make. I can see buying these again. Tires are still doing great . No problems with heavy hay loads..
From the first day !!! I noticed that the boat handles the road so much better, It feels like Im not towing anything behind the truck. Im so very happy !! Can you change trailer wheel size from 13 inch to 15 inch on the same axle? Yes you can go with a 10 Ply Load Range E tire for your trailer in the size of 225/75-15. For that we have the part # TR225LRE which has a weight capacity of 2,830-lb max load at 80 psi. What I also really like about this tire is that it has a higher than normal speed rating at 81 mph as opposed to most trailer tires that are only rated to 65 mph. 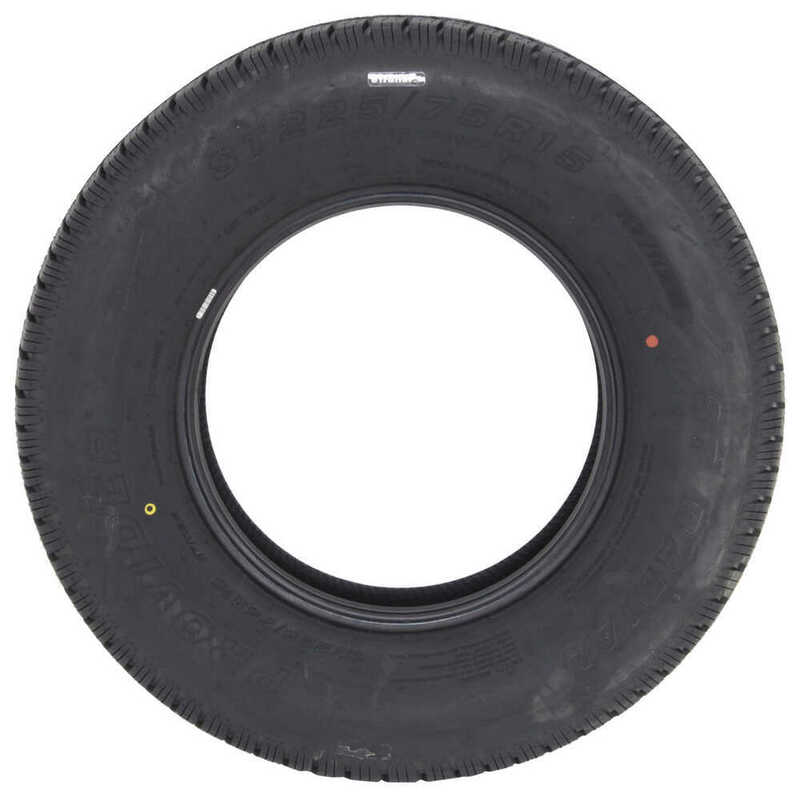 We do have a Load Range E tire that would work for you but it is about a half-inch shorter when installed. We do not offer a tire that has the exact dimensions of the tires you currently have. The tire we offer is part # AM10414. This is a 10-ply tire and has a capacity of 2,403 lbs at 70 psi. A ST225/75R15 size tire is really designed to fit a slightly wider rim than yours. If the rim happens to be 6 inches wide one would fit like the # TR225LRE. The tire you want is part # TR225LRE. This is a radial tire with a weight capacity of 2,830-lb max load at 80 psi and has a high enough speed rating to allow you to travel 70 mph. This tire has a speed rating of 81 mph. Most trailer tires are only rated for 65 MPH. The Provide Tire part # TR225LRE is a Load Range E tire that has a capacity of 2,830 lbs at 80 psi. Unlike most trailer tires this has an 81 mph speed rating which is much higher than most tires that are 65 mph rated. Our highest rated 225/75-15 sized trailer tire is the Taskmaster Provider # TR225LRE. This is a 10-ply radial tire with a Load Range of E and a maximum load capacity of 2,830 pounds at 80 psi. The speed rating is M which is up to 81 mph. Trailer tires and vehicle tires are designed differently. Trailer tires are designed with much stiffer sidewalls so that they can handle vertical loads better and vehicle tires are designed for steering axles as well. For your tire size of 225/75-15 I would recommend the part # TR225LRE. This tire has a capacity of 2,830-lb max load at 80 psi and a higher speed rating of 81 mph compared to most trailer tires that are only rated for 65 mph. Going to the next larger tire size of ST225/75R15 would certainly be possible unless your fender and frame clearances are super tight on your trailer currently. You would end up with roughly 3/4 of an inch less of fender clearance and the tire will be 20 mm wider. My favorite tire in that size is the part # TR225LRE which has a 2,830-lb max load at 80 psi and has an 81 mph speed rating which is much higher than most trailer tires. The tire you want is part # TR225LRE. This is a radial tire with a weight capacity of 2,830-lb max load at 80 psi and has a high enough speed rating to allow you to travel 70 mph. This tire has a speed rating of 81 mph.